Having a mad crush on her boss's son, Matt Lacroux - an intriguing mix of proper gentleman and flirtatious bad boy - is probably not the smartest idea for single mother Mira Savage. Especially when the company, and her job, is already on shaky ground. But as a Princeton professor, Matt's life is hours away from Mira's home on Cape Cod, keeping him safely in the fantasy-only zone. And as a single mother to six-year-old Hagen, with a floundering company to save, fantasies are all she has time for. 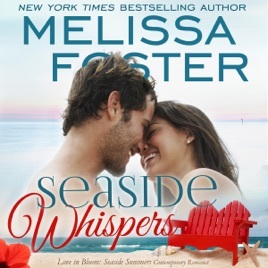 Seaside Whispers is an amazing book by Melissa Foster It is narrated by BJ Harrison. He did amazing with narration. I love this book. It is about Matt Lacroux & Mira Savage. Matt is a college professor who is taking a break to write a book. Mira is a single mom of an adorable little boy. She works for Matt's dad. They had previously met and kept in touch ever since. You can't help but fall in love this super hot couple Matt and Mira. super good book!! Seaside Whispers is another great addition to the Seaside Summer series. Matt has always focused on his goals, but lately he has been wanting more. Matt spent time with Mira and her son last summer and that is all he can think about, especially when all of his siblings are falling in love. Mira is a single mother who is focused on her son. She has kept in touch with Matt since last summer and is happy when Matt takes a sabbatical and moves back home for a few months. Mira tries to protect herself from getting too attached to Matt, knowing he will be heading back home after his sabbatical. Matt and Mira's relationship starts off as friends first and throughout the story their relationship grows. I fell in love with Matt and Mira from the very beginning. I love Matt's alpha side but also his soft, romantic, nurturing side as well. This is a great series by Melissa Foster and I can't wait until the next book. BJ Harrison you are amazing. Your voice portrays these characters exactly as I expected them to be. You take characters that have feelings and brought them to life for me. Melissa Foster…. Oh what you do to me. The heat, the passion, and the love are always amazing in your books. Seaside Whispers is no exception. While I LOVE LOVE LOVE all that what I really enjoy is the friendships. The Seaside Girls are absolutely the best friends anyone could ever ask for. I love how the open their “club” to other girls as they become part of the friendship circle. Of course there was chunky dipping, helping Mira achieve her goals, and support with every aspect of life. The relationship between Matt and Mira was sweet. They’ve been flirting through text and occasional visits for over a year and when he decides to take a sabbatical for 3 months their relationship takes off. Matt didn’t just have a relationship with Mira he had a relationship with Mira and Hagen, Mira’s 6 year old son. The way he accept and included Hagen in all they did warmed my heart. I could understand how Mira was anxious about just letting Matt into their life when his plans were to leave again. Hagen and Mira both fell in love with Matt and him leaving would shatter them. I loved the ending. Theresa is hilarious. Bella, one of the Seaside Girls, has pranked Theresa each season and Theresa gets the last word this season. I laughed so hard as tears fell because the moment was just so sweet and wonderful. I see a future with many more pranks.